The Rolex 1160 Caliber ran alongside the various iterations of the hugely popular 1500 series for a number of years. Rolex have always preferred to gradually phase in replacements for their calibers, rather than with a sudden, jarring leap. 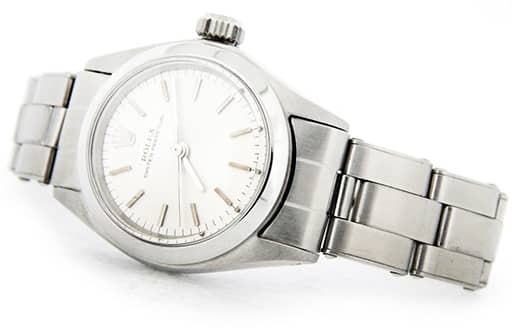 In the seventies, the 1500 series went through a similar process itself when Rolex superseded it with the 3000 range. Rolex’s 1000 series of automatic calibers debuted in 1950, with the base model, the Cal. 1030. It marked the company’s first bi-directional self-winding movement. This is a highly reliable and accurate 18,000bph mechanism. It found great success inside that era’s Submariner, Oyster Perpetual and Explorer range. From that basic, no date architecture, the Cal. 1030 went through a number of variations. The GMT and calendar complications were added where needed, along with Rolex’s characteristically relentless upgrades as their technology progressed. In 1964, the series entered its third generation when the Rolex released its 1160 and 1161 calibers simultaneously. With these new calibers came an extra jewel. There are up to 26 from the previous 25, along with a new balance frequency. This frequency increased for the first time to 19,800bph, or 5.5 beats per second. In addition, there was an inherent increase in accuracy and shock resistance. By that time, the Sub, Explorer and several other of Rolex’s simple, three-hand watches had found new engines with the 1500 family of calibers, the last low-beat movements the brand produced. In addition, for the Rolex 1160 caliber, its modest dimensions saw it used in just one model in the Rolex catalog. At only 20mm wide and with a height of 5.4mm, it powered nearly 30 different references of the Oyster Perpetual series. Introduced in the 1950s, the brand’s simplest watch has one of the most confusing names. Subsequently, every automatic, waterproof Rolex wears the Oyster Perpetual tag. The company patented the self-winding mechanism in the 30s and called it the ‘Perpetual’ movement. The impenetrable shell they are housed in, formed by screwing the bezel, case back and winding crown down against a solid midsection, has been known as the ‘Oyster’ case since the 1920s. However, Rolex also titled a particular collection of watches the Oyster Perpetual range. These were regarded by some as Rolex’s most versatile. About as basic as a watch can possibly be, the series has been in constant production for more than six decades and gone through a countless number of variations of materials and colors. The Oyster Perpetual is as popular with women as with men. It is available in a slew of sizes, from 26mm to 36mm. The year 2015 saw it joined by another edition when a more modern 39mm was added to the lineup—not a monster by any means, but one keeping up with the fashion for larger timepieces. The Cal. 1160 began service in 1964 in the ref. 6544, a midsize, steel example of the range, and ended in the early seventies in the ref. 6807. Rolex replaced this with the Cal. 1570, which introduced a seconds hacking feature. Although often regarded as the entry-level Rolex, and the watch that represents the buy in to the brand for new collectors, the Oyster Perpetual range still benefits from the same level of engineering excellence and attention to detail as anything else that bears the Rolex name, and nowhere more so than in its mechanism. In addition, the Rolex 1160 is a chronometer certified movement, rated accurate to within -4/+6 seconds a day. Also, its free-sprung Nivarox hairspring features a Breguet overcoil, and it has a power reserve of 42 hours. Its balance wheel is regulated by Rolex’s Microstella system, two pairs of weighted screws on the inside of the balance rim that makes the wheel more aerodynamic and its adjustment easier to fine tune. Moreover, the Cal. 1160 is one of Rolex’s lesser-known movements, with a relatively limited production run. Serving as the forerunner to the 1500 series, among the most popular and enduring family of calibers in the brand’s history, has consigned the 1160 to dark horse status in the history books. However, as owners of vintage Oyster Perpetual watches will tell you, they are a precise and reliable performer, a simple and robust movement with a fine pedigree.